Whilst it's great to hear about big projects and buying whole new armies, the dedicated wargaming nerd also knows the distinctive pleasure of modest bargain purchases, especially of things you never knew you needed until you found them online. Here's a couple of my recent ones. How cheap are your palm trees? Thinking it was time to assemble a little ancients-style terrain for my Trimsos armies, I started searching for palm trees, and happened on some ultra cheap ones on ebay. Ten for less than £3? And post free, for Christ's sake. I had to try them. Thinking they would be junk, I was pleasantly surprised when they finally arrived (about 10 days later). They were actually pretty good, well up to my requirements for wargames terrain. They come with 1cm pegs moulded to the end of the trunk, which I removed before tacking them to some pennies with super-glue. Then I reinforced the bond by spreading Araldite around the base of the trunks. Now it's time to base them up properly. These will do fine for me. There's a whole range of them on ebay in different sizes, retailed by the same Chinese company, 'toysloveit'. They also have other types of trees dirt cheap. This turned out to be a bit inconvenient for the players, who had to shuffle large numbers of figures around in a cramped space trying to get their deployment sorted out. How much easier if the various brigades were available on convenient trays, stored on any nearby level surface, which could be brought to the table as required for the unloading and deployment of the various units. So again I got busy in the interweb. There's plenty of relatively expensive stuff out there, but then I happened on the products of a catering supplies company called Nisbets and found these babies. Yes, £1.80 each, with £5 postage which gets you next day delivery. I ordered four, once again not sure what to expect. And once again I was very pleasantly surprised. These are solid, well moulded, hard-plastic items designed to put up with daily abuse in your typical cafeteria. They'll last indefinitely, as far as I can tell, and come in a tasteful British racing green. They have a nice non-slip interior surface which should avoid your soldiers or vehicles sliding around too much. The photos show some 28mm Prussian grenadiers loaded on board. These small size trays are 10" x 14", but you can also get get medium and large, as well as a good range of other colours. I expect to get some good use out these fellows, but at £13.20 for the whole order, who cares if they only see occasional service? And so my week has been brightened by the simple pleasure of receiving these items. My wife thinks I'm crazy, but as I always tell her, she should be thankful I don't go online to empty the family bank account through internet gambling. Such rational arguments, however, appear to have little effect on the female mind. Those trays are an excellent idea! One that I will file away upstairs for future reference and use. Your new palmtrees remind me of the 100 'Birch' trees that I purchased in a a large poly bag from a cake decoration and baking supply way back in 2006 or '07 for, I think, less than US$10 at the time. As you say, something one doesn't know he needs until he sees it. These still form the basis of my tabletop woods when everything is set up. After more than a decade of use, I attached them to irregularly shaped terrain bases early last summer assisted by my then six-year-old son. Ah yes Stokes, I know those trees well from your blog. Glad to be in the company of another bargain hunter! 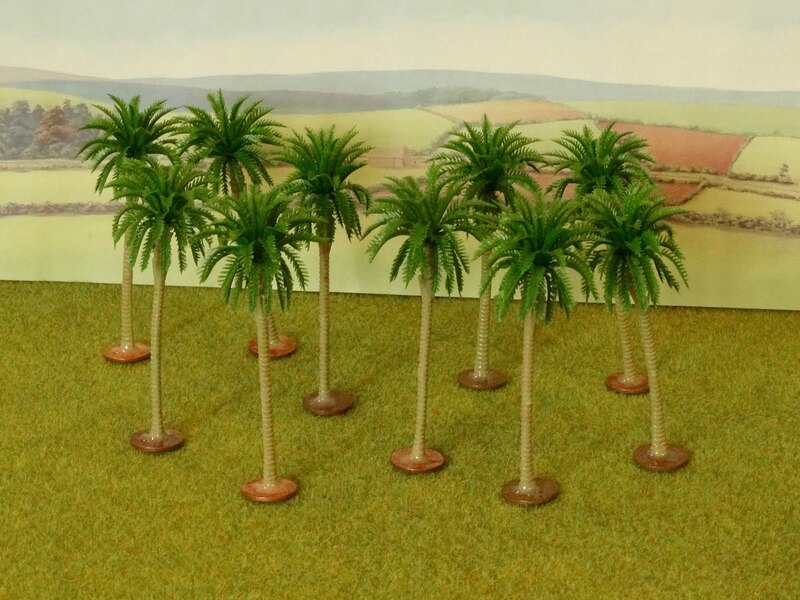 Palm trees are a great find just ordered some myself thanks for sharing. Ah, yes. The tea trays are a great idea! 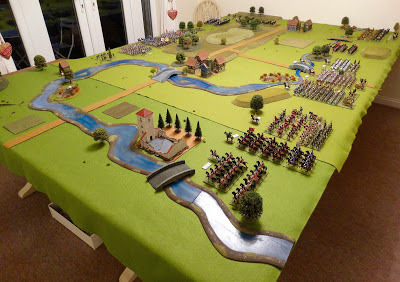 I'm in the same boat as Steve-the-Wargamer. Maybe I will look for a tea tray or two (like a tea tray in the sky, as the song says). Dear Keith. I really like the thrifty ideas. I have used metal baking trays (until the domestic authority decided to do baking and discovered that her trays were now covered in troops). It works really well for troops with magnetic bases and eases deployment and storage issues. Many years ago I got my step-dad to make me wooden hedge bases (he was a woodworker and needed to justify his garage full of kit). We used recycled floor board - it was just the right thickness for the base for a 15mm hedge (or 6 mm bocage). Dear Keith. I really like the thrifty ideas. 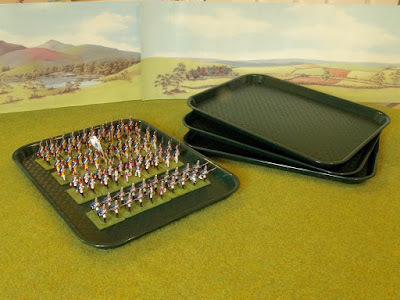 I have used metal baking trays (until the domestic authority decided to do baking and discovered that her trays were now covered in troops).